Atoms are the basic building blocks of nature. The understanding of the atom has gone through exiting steps and we will explore the main ones. “Atom” comes from átomos (Greek “ἄτομος”, from α-, “un-” + τέμνω – temno, “to cut”), which means uncuttable, or indivisible, something that cannot be divided further. Vaisheshika / Vaisesika (Sanskrit: वैशॆषिक, IAST Vaiśeṣika), is one of the six Hindu schools of philosophy, the Vedic system of India. It was related to the Hindu school of logic, Nyaya. The Vaisesika classifies in categories and says that all in the universe can be reduced to a given number of atoms. Kanāda is considered to be the founder and author of the Vaishesika Sutra (Full text at archive.org). 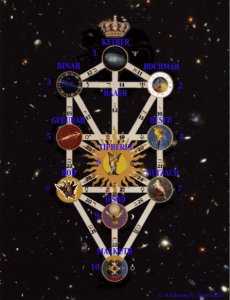 Kanāda says every object of creation is made of atoms (parmanu) which in turn connect and form molecules (anu). Sources disagree with the time Kanāda lived some say in the 6th century BCE some around the 2nd century BCE. The Greek Democritus (C 460- c 370 BC) is the one that got the fame for having discovered the atom. He mentions many Greek philosophers in his writings. Democritus inherited wealth and could travell and he purchased many writings of other philosophers. The theory of the atom is believed he got from Leucippus that influenced Democritus, but the very existence of Leucippus has been the subject of disagreement between scholars, even amongst the old Greeks themselves. 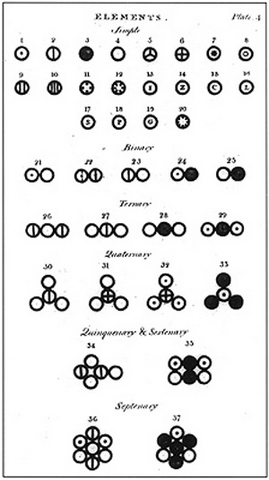 Democritus claimed that the properties of things were determined by the shape of its atoms. Sweet things had smooth atoms while bitter things are made up of sharp atoms. Not strange in the context of the stage of mathematics at that time in history and the preoccupation with geometry and shapes. Plato and Euclid were younger contemporaries. If it was Kanāda, Leucippus or Democritus or somebody else who first put forward the concept is uncertain. Some even say the Greeks got the idea from the Egyptians. The god of creation standing between the nothing and the something Atum, also spelled Atom, is even said to be the source of the word atom. Ph.D. George G. M. James in his “Stolen Legacy: Greek Philosophy is Stolen Egyptian Philosophy” show how the concept of the god Atum ”the all and the not yet being” represent the principle of opposites as Democritus talks about the atom as ”movement of that which is” (To on) within ”that which is not” (To me on). James also makes arguments for the transliteration of the Egyptian word into Greek. If one is to accept this as the beginning of the concept of an atom it goes back to 4000 BC. According to René Adolphe Schwaller de Lubicz (1887–1961) Egyptian gods, or Neteru (pl. – one Neter) as they are called were regarded as principles in nature, more than personifications. Personally I think it was both, as if the Egyptians were still in connection with a deeper layer of consciousness that is collective and is beyond both our awareness and the manifestations in nature. Kanāda connected his atomic theory with the element and spoke of fire atoms and water atoms etc. Dalton said elements are made of small atoms, and each atom of an element have the same size, mass, and other properties, while atoms of other elements are different. Atoms cannot be divided, or crushed. They are the building blocks and combine as a whole unit with other atoms to make the different compounds. 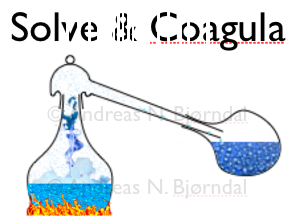 Chemical reactions are combining, separating or changing the structure of the earlier compounds. Dalton also suggested a “rule of greatest simplicity”, but with the lack of experiments that could confirm it, it was controversial. It is likely to believe his mystical inclined mind was looking for a unified simplicity at the basis of nature. He also regarded Hydrogen to be the unit = 1, which fits well with modern physics. 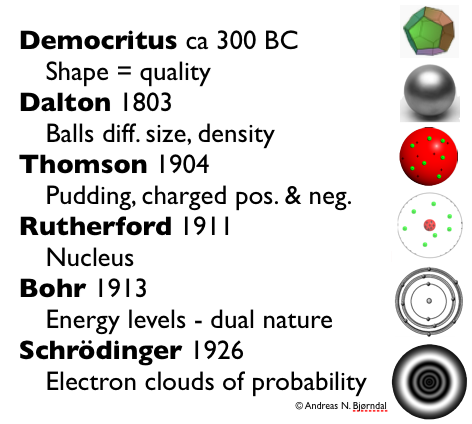 So far atoms are dense balls of different size and weight. Sir Joseph John Thomson (18 December 1856 – 30 August 1940) discovered in 1897 that cathode rays were composed of an unknown particle. Calculations showed it to be much smaller than the atoms. Compared to its small size it had a very high negative electric charge. The first subatomic particle, the electron was discovered. This made it necessary to have both positive and negative parts in the atom and the “pudding model” became the updated atom. The famous experiment by Rutherford, where the thinnest layer of gold foil was bombarded with alpha particles to measure the gold atoms – the gold puddings – resulted in discovering the void. Basically he rarely hit anything, most particles went straight through. The nucleus was discovered and we got a centre with some far off satellites as electrons. Niels Bohr discovered those electrons to move in energy levels and that they had a complementary nature as either showing themselves as particles or waves. This can be difficult to understand, but let us make an analogy. Imagine you have a sheet of paper that you hold up in the air so that electrons going through the paper can create holes. If it is the particle side that goes through it creates a triangular hole if it is the wave nature a circular hole. By the end you have, lets say 50% of each. You conclude from the paper and its holes that reality consists of two things; triangles and circles. Then Bohr says; but imagine they are cones! If they go through with bottom or top they create a circular hole, if side vice the hole becomes triangular. Reality does not consist of triangles and circles but of cones. By going up from a two-dimensional plane to three dimensions, two different things become one and the same. But particles and waves are not flat, so the unification does not become three dimensional but at least four dimensional. This might just confirm how the atom with time has started to challenge our perception, but we know that is is more unified in its particle-wave aspects than first thought. Now the atom became like a solar system with a sunny nucleus and electron-planets circling around. The exception would be that more than one planet orbited in the same circle, but still it was a model of the micro cosmos that fitted with the macro cosmos. This model is still what many people believe, learn and teach. But the modell has advanced more steps. Compare each level or orbital to a surface on a huge ball. With balls around balls, like the Russian Matrjosjka dolls. Imagine each surface of the balls to be a sea that is constantly pulsating. 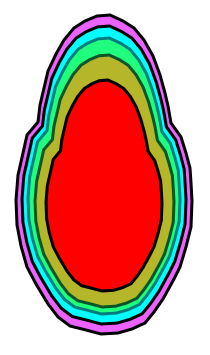 The inner ball pulsates with 1, the next ball is an octave and pulsates with 2, the third a quint and pulsates with 3, the next is an octave of the first octave, the fifth and sixth etc. all increase its waves with one wave length. The electrons would be the white froth at the top of waves appearing and disappearing from one place to another, without moving from one place to the other. Like a musical note that has a constant sound and a few times additionally sparks up with a flash. The flashes would always amount to a set number in each ball and when one disappears another one appears at one other spot, but it does not move from spot to spot. Schrödinger turned the whole periodic table, all the atoms in the universe into mathematics. With equations and four variables he was able to explain all the building blocks or atoms. In many ways this is the most completed understanding in nature with big certainty and good descriptions. As soon as we enter the world of living things we become much more uncertain and different opinions take place one after the other or play against each other. We can say that with the four variables and a few simple rules basically to explain that each atom is different than another in one way or the other, the principles or laws behind the atoms are simply and beautifully explained. With Schrødinger and his quantum numbers the atoms entered the world of quantum physics and probabilities. 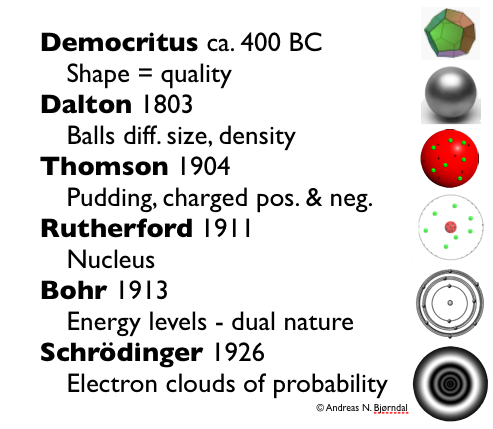 Atom has changed from a geometric solid where shape was believed to carry qualities as taste and colour, into balls of different size and weight. Different shapes became one ball, turning to puddings, from puddings to minute solar systems where particles and waves became one wave-particle. And then into foggy mists that sparkle particles or wave tops almost like a person calling to different friends around the world and make their phone screen brighten up. The solid ball atom has lost its materiel aspect, but the very small and extremely frequent appearance of “particles” creates a feeling, a perception of a solid surface. If we diminished over selves to the size of an atom, matter would disappear and a sparkling ghost would be the only thing left. It is the same as if you magnify the picture in a paper you would disappear between small coloured dots. Or if you have seen people with banners on a stadiun creating different colourful images, they might appear smooth and connected from distance but are just separated fragments. The micro cosmos is quantified, but the driving force behind it is not. It is only our perception that is limited. We see circles and triangles where there are ghostly cones. The phenomenon we sense are more connected than our mind is able to perceive. As we go deeper and deeper into matter it disappear in front of us, it becomes a sparkling fire or a potential energy that incarnates in a split second to excarnate in the next. The atom is like a ghost that comes and goes. Behind every material manifestation there is a ghost.